Women in the Scriptures: Have You Opened Your Gift? Have You Opened Your Gift? 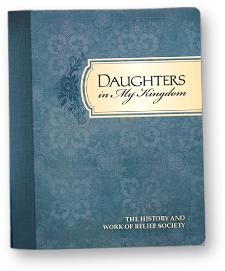 the "Daughters in My Kingdom" book! Now is the moment when I try to make you feel guilty. but read it cover to cover? highlighted it, and written notes in it? or for Family Home Evening? If you haven't you are definitely missing out on a beautiful gift. I think I was expecting it to be more of an apologetic book, defending and explaining the history of the Relief Society, but it isn't. It is something much more powerful. After I let go of my agenda about what I thought the book should be about I discovered the real message of the book. My heart expanded and I began to see that it is a beautiful and powerful (official church) history of God's dealings with his female disciples in the latter-days. One of the main reasons there aren't as many women as men in the scriptures is because throughout most of history women have been unable to preserve their histories in written word. Most of the records we have today were kept by men and as a result we don't have very many female voices in the scriptures. Just imagine if the earlier Relief Societies had been able to create something like "Daughters in My Kingdom". What if the Relief Society of Sarah, Rebekah and Rachel or the Relief Society of Mary and Martha would have written their own history? If they had recorded the spiritual experiences they had, the commandments they had received from God, the service they rendered, and the challenges they faced? That would be a treasure beyond all measure. So I can't tell you how excited it makes me to see a book, written by a woman, that is totally dedicated to preserving and recording the stories of women and their relationships with God. I'm not trying to be prophetic but it is my guess that if the Lord ever commands another book of scripture to be written-- one, that like the Book of Mormon, preserves the spiritual history of a people-- that "Daughters in My Kingdom" will most certainly be included. I can't help but feel that God wanted this book written not only to help His daughters who are living on the earth now to better understand what their privileges and responsibilities are in His kingdom, but also for the future generations of His daughters. I think it may be His way of making sure that the stories of His daughters, and their contributions to His Kingdom, don't get lost or forgotten. He knows that they have powerful and important voices that need to be heard and "Daughters in My Kingdom" is all about preserving those voices. I highly recommend that you do. I've opened mine and I, too, feel it is a very very special gift to the sisters in the Church. I had many of the exact same impressions about Daughter in My Kingdom at first glance, but came to understand that it is so much more! I read it cover to cover on our road trip to Atlanta and absolutely loved it! What a gift! I've been reading... I'm over halfway through... I'm loving it!